The following games are well suited to the knight theme and with a little bit of fantasy knight tests, tournaments and duels can be packed into a story or can be used for an adventure game. Knight’s tests: These are station games. Each knight and each team tries to collect as many points as possible. These games can generally be played parallel to each other. Each of the competitors puts a helmet (paper hat) on their head. Two opponents are attached to each other with a 2 meter long rope tied to their left arm. Who will be the first to knock his opponent's helmet off? Both fighters hold onto a stick with one hand. Who will be the first knight to have the stick solely in his own hand? Some well padded non-dangerous swords should be produced for the various knight’s games. Sweeping brush handles which are covered with insulation material for pipes which is used in heating systems are suitable for this purpose. A round piece of wood with a hole in the middle which has the exact same diameter as the sweeping brush handle serves as hand protection. The stick is pushed through at the bottom. The protective plate cannot slip upwards due to the insulation padding. The grip is padded with sticky tape, which is also a good idea for avoiding the protective plate slipping off. Clear game rules must be agreed before a fight. Strikes around the facial area are certainly not allowed. If you dip the point of the sword or the complete sword in washable paints or with soot you can see the strikes better. However the clothes are messed up. Each of the two opposing knights receives a long balloon which is blown-up. The end of the balloon is dipped in Russ or shaving foam. The two knights now have a sword fight. Each of the two opposing knights has several blown-up balloons attached to their chest and back. The two players now try to burst their opponent's balloons with a plastic sword. The winner is the player who is the first to burst all of his opponent's balloons. A tree is guarded by a blindfolded player (member of staff). Who can creep up to the tree without the blind guard touching the player who is creeping up? You must take care that the blind guard does not run against the tree and injure himself. An alternative might be to use a pole or a gymnastic mat laid out on the floor. Two players standing on a tree trunk (a crate works as well) and must try to push the opponent from their perch, only using their hands /arms. Each opponent stands on a tree stump (a crate is also ok) and they both hold onto a stick. Now they must both try of knock their opponent off balance. Each of the competitors has a handkerchief stuck in the top of their trousers. The two players are attached to each other with a 2 meter long piece of rope on their left arm. Who will be the first to pull the handkerchief from their opponent's trousers? Each player makes themselves a bow and 1-2 good arrows from suitable willow canes. You will to plan approximately one hour to complete this. Competitions can then follow: target shooting and distance shooting. For this game you will need two long lances which are well padded with foam or towels. While sitting on a piggy back, in a cart, or on a bike, the opponents charge at each other. Option: Similar to dodge ball. However the ball may be rebounded with the shield. The playing field must however be enlarged depending on the number of players so that they don't all come into contact with each other with the shields and to avoid hectic. Wagon races have existed since the wheel was invented. This is a race over sticks, stones and rough ground while on piggy back or in a cart. Two players make up a team. With one partner on the other's back, they try to pull their opponent off their partner's back. You can make up your own individual game rules. In order to take the roughness from the game, instead of pulling the player down, they can also remove a handkerchief from their opponent's trousers. Which team has managed to steal the most handkerchiefs? The whole team pulls against a second team. A tug o’ war is always entertainment for the whole group and another 15-30 minutes are easily saved. A fire can even break out in a castle. All of the knights must now make a water chain and move the water along in a bucket. The water must be collected from a stream/river. The bucket is hanging on a rope. The bucket may not be filled by using the hands to scoop water into the bucket. Heavy metal buckets are suitable for this game. Who will fill their tub the quickest? Each competitor blackens their fingers with charcoal. Now everyone tries to blacken the other players without being blackened themselves. The loser is the person/team who has the most black marks on them. Monks translated the bible. A verse of the bible which is cut into puzzle pieces (single words/sentences) must be put back together. When capturing castles a battering ram is needed. However the long piece of wood must be carried to the castle before it can be used. An obstacle course is marked out with tape in the woods and makes zigzags through the trees. With a tree trunk approx. 10 m long, the group must try to transport the trunk through the obstacle course as quickly as possible. They are not allowed to step out of the marked areas. A stone which is not too heavy is chosen. 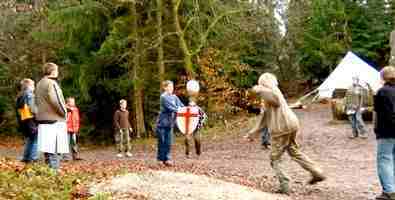 Using a measuring tape, the knight’s throws are measured to find out who can throw the furthest. Spectators should stay away from the firing line. The knights climb over a wall. Depending on how high the wall is, you might use the famous hock up, or with the help of a ladder / tree trunk. This must be practised too. A castle wall is captured by use of a hanging rope. However capturing the castle is only possible if the knight makes it to the top of the rope. Not all knights have learnt good etiquette. Who can spit the furthest and burp the loudest? We already know that some can fart very well; we do not need to prove it in a competition. Similar to the javelin, the players own swords are thrown as far as possible. Extra points are awarded if the sword sticks into the ground/sand. Holding a lance in the hand while blindfolded, a target must be hit. A member of staff leads the game. The game also works on piggy back. The rider on the partner’s back is blindfolded and must hit a balloon or a ring hanging in a tree with the lance. The horse under the rider gives the instructions. How long does the horse and cart need to complete the task? Approx.15- 20 locks hang on a rail and are locked. The same amounts of keys are in a box. Within a certain amount of time, all locks should be opened with the keys and then closed and hung up again. A member of the group jumps onto a seesaw and launches an object into the air to hit a target. In this game, it is not important how far the stone is thrown. The aim of the game is to throw the stone as far as you think you can jump (without a run-up). If the player reaches the stone with his jump, he is allowed to throw and jump again. If he does not manage to reach his own goal, the next player must start off from the last point which was achieved. How far will the team go? A castle is attacked and destroyed. In order to bring the castle wall down, sharp shooters are needed. Cans are shot at with a catapult! Tin cans are shot at with a stone thrower! Beware: No-one should be in the way of the shooting direction. There should also be nothing behind the shooting area (people, street, house, tent, windows etc.). A rider sitting on piggy back must make their way through an obstacle course and try to strike objects with a lance (skittles/balloons). At the end of the course they must collect a band and bring it back to the starting point. Then it is the next teams go. How quick is the team and how many faults will they make? A lance might already be available; otherwise the group can make one from suitable wicker. The aim of this game is to throw the lance as far as possible. Another possibility is to have a lance throwing target. The lance must be thrown into a marked out area, thrown through a ring or thrown at a hanging balloon. A player throws a rubber ring to his partner. 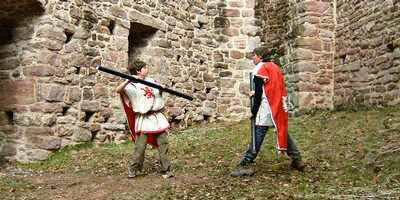 The partner then catches the ring with a sword or lance. How many rubber rings will be caught from 10 throws? A rider sits on his partner’s shoulders. The horse must gallop and the rider must hit a small ring with a lance. The ring is hanging in a tree. The horse is not allowed to stop or slow down, the horse and rider must keep moving. The group makes a catapult with the help of string, a handkerchief and some round wood. The aim is to prove your shooting talents by hitting targets or shooting the catapult as far as possible. What did the barons want to find? Treasure of gold and jewels. What was meant by the term “picking the table up"? The table was made up of loose boards which would be put away after a meal. How was the entrance to the castle protected? With a draw bridge and a grate! 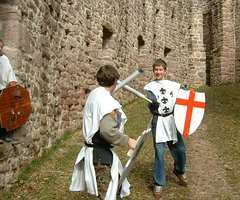 What was the part of the castle called in which the castle master hid once the walls of the castle were overcome by the enemy? The castle tower. How many knights were in King Arthur’s round table? 12, but there was space for 150 people at the table. 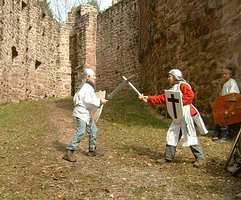 What were the holes in the castle walls called through which oil, water or arrows were shot at attackers? Arrow slits. Life in the middles ages was not easy. Varlets, maids, women and servants had to master quite a few things in life. The following tasks can be turned into an adventure game or a station game. There were different jobs in the middle ages. Tailor or sewing was one of these jobs. Who can sew on the most buttons in a certain amount of time (rip test) or sew a specific pattern from a sample pattern? The group must prepare and make a stew in a cauldron / kettle. The ingredients are: Vegetables, water, herbs, salt etc. Almost every household in the middle ages had a goat and a cow. Milking the cow or the goat must be learnt. If you have the possibility and a willing cow or goat, you can build this task into a station. I do doubt, however, if the cow will still be producing milk when 20 teams have had a go. For this reason, it might make sense to limit this task to 4-5 teams. There weren’t any washing machines in the middle ages. Wash day was once a week. The group must was 10 shirts and pairs of trousers and hang them wet onto a washing line. The following can be judged: How clean is the washing in comparison to beforehand? How long does the washing take (wet the clothes and hand them on a line 100 meters away)? The group has the task of bending a piece of metal 2mm thick and 1cm wide into a 90 degree angle in the middle. You will need: Bellows, 2 pliers, heavy duty gloves to protect from the heat and burns and of course, a flame. Judging: How long does the group need to get the metal glowing? How far will the group manage to bend the metal into the required shape? Weaving was also one of the middle age jobs. If you have lots of wool and a little weaving stool (usually from kindergarten or primary school times) you can build this task into a station game. Judging: How many rows can the group weave in a specific amount of time? How many weaving mistakes are made? Once all teams have had a go, you will probably have a little weaved carpet. The gold forge did not only work with gold but also made some other pieces of jewellery. The group has the task of threading a bead necklace together. The quantity of beads (the length of the necklace) which are threaded within a specific amount of time is judged. As an alternative, the group can also be sent to collect herbs. They are either given a list of the herbs, plants, vegetables, seeds which they must collect or something is whisked up from the different things they find. Jugglers moved from town to town and offered entertainment just like the jesters. The jester always has silly and clever phrases on offer; he can perform and makes people laugh. You probably already have a camp clown who doesn’t need much practice to be a jester in the camp circus (juggler evening). Who is the best jester? A bear dressage with a half tame bear was a piece of theatre. If you can find a bear costume, you can study and perform a bear dance. Walking on long stilts was not so easy. The idea can built into a station game or a stilt dance can be studied. Minstrels used song just like the heralds shouted to communicate love messages. How would it be to turn the group’s activities into a minstrel song? A few jingles and rattles and the plucking of a string instrument support the singing. Which group will offer an original possible hit? Monks translated the Bible. A Bible verse, (cut into puzzle pieces – single words, phrases) must be put back together.